Allow your staff to access your records from any location that has an Internet Connection? From remote cemetery offices or even from home? Use the latest technology such as a PC, Mac, iPad or a Smartphones to access and fully administer your records? Allow you to publish your records online via your own website and retain all income generation? Receive regular upgrades and support without any lengthy delays? Is securely hosted online allowing access from any location with an Internet Browser. Business continuity and disaster recovery is no longer a problem. Allows you to set up supplier accounts so that they can gain direct access to specific parts of your system. 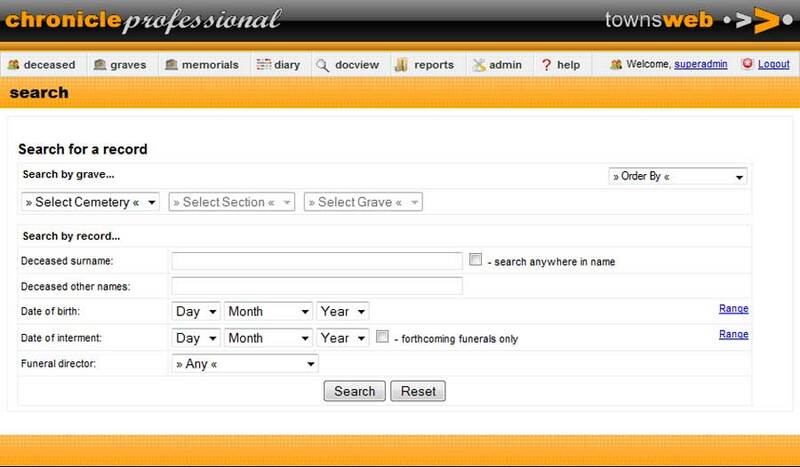 Great for allowing funeral directors and stone masons to view grave information. Incorporates DocView – a module with ‘virtual technology’ allowing you to flick through every page within every scanned cemetery map, burial register, grave register or cremation register. Records memorial inspections using internet enabled handheld technology such as an iPhone or BlackBerry. Inspect and record ‘live’ in your grounds without any need for docking or uploads. Q. What functionality does Chronicle offer? Q. Where is Chronicle installed and how can it be accessed? A. Chronicle is a hosted application which means that no software is directly installed on your computer. It is accessed from any location that has an Internet Connection whether that be at your main headquarters, from remote offices or from your home. It can even be accessed via a Smartphone on a bus on the way home! Q. Our Local Authority must provide ‘Business Continuity’ should we be unable to gain access to our office where our records and systems are kept. How is this achieved? A. You do not need access to your office or your I.T. network in order to access your records. Chronicle by-passes your I.T. infrastructure and is accessed via the Internet. Your I.T. Department like hosted applications because they are hassle free: no software is installed on your computer; your computer does not need upgrading; you do not need access to your internal servers or networks to access the system; your I.T. department don’t need to worry about providing access, storage space, support or backups. Q. Our handwritten registers and maps are held at our main Cemetery Office. They contain very important information. Is it possible for our remote staff to access them via Chronicle? A. Yes. Our DocView module allows all of your scanned maps and every page within every register to be accessed. Virtual page turning software means you can flick through the pages as though you’re holding the book in your hands. You can print and email individual pages. You can even copy and paste parts of a page in to external applications such as Microsoft Word and Outlook. This is great for Genealogists who appreciate receiving hand-written entries from original records. Q. It would be very useful if we could provide Funeral Directors with access to our records. Can we allow them to access our records but not update them? A. The user administration area of Chronicle allows you to set up 3rd party accounts. These accounts can be for Funeral Directors, Stone Masons or even other areas of the council such as local history library staff. You control the areas of the system that they can gain access to and whether or not the 3rd party can update or just view your records. Q. We would like a system that can record Memorial Inspections ‘live’ as we are testing the stability of each headstone. Can Chronicle do this? A. Chronicle has been tested on the latest iPad’s, Smartphones and Netbook computers. If these devices are in close proximity to the Wi-Fi router in your offices or if they are connected to the Internet via a data card or sim card then they can access Chronicle and allow you to record Memorial Inspection data ‘live’ in to the system. This saves the time and cost of capturing records on a remote hand-held device, docking the device on your office PC and uploading the data in to your system. Q. What about support, upgrades and bespoke changes to Chronicle? A. Your system is hosted on our servers which means that our technical support team can access your system and records remotely. They can see exactly what you see on your screen which makes support easier than ever. Upgrades are rolled out simply by applying the new version on the hosted server – there is no need for you to experience lengthy delays waiting for our staff to visit you. 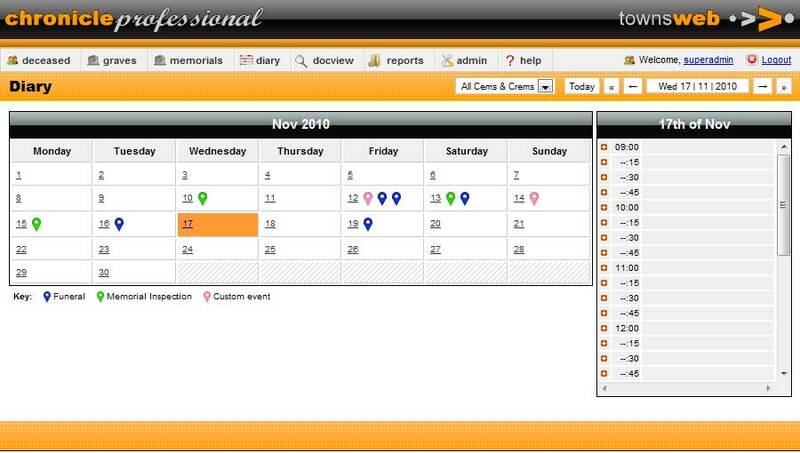 Similarly if you require any bespoke changes they can be implemented in real-time, live on your remote server. Q. Can Chronicle publish records on to our website for the public to access? And if we wanted to charge for access is this possible? A. Because the Chronicle database is hosted online it is very easy for your website to incorporate its’ records. Furthermore, when you update and add records within Chronicle they are shown ‘immediately’ live on your website. Our web development team can design a completely new website for accessing your records. Alternatively they can simply create new pages that will sit within your existing website and incorporate payment mechanisms if you wish to charge for access. Because this content is displayed on your own website you will retain 100% of any potential revenue. “Wootton Bassett Town Council commissioned Townsweb Archiving for two projects. Firstly, to create a new website and secondly, to digitise our cemetery records. Townsweb listened to our requirements, ensured that they were all met and, most importantly, delivered a professional service throughout the process. 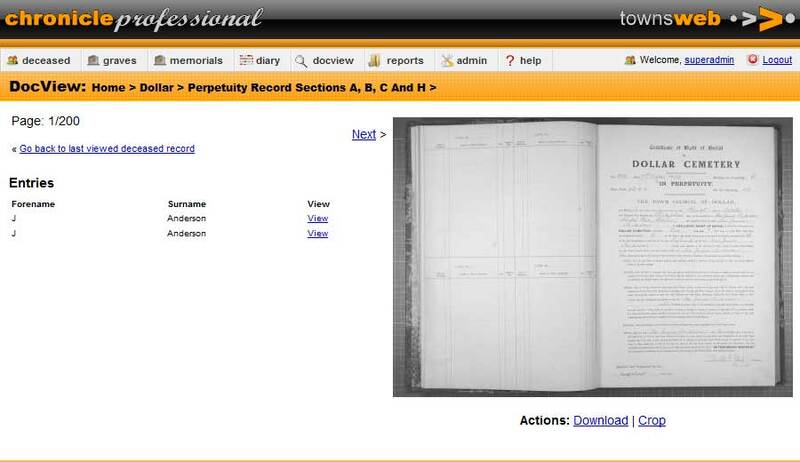 We were delighted with the quality of the digitisation of our cemetery records, which were linked to our new website. We have had lots of positive feedback from the users of our new website. If you would like to see a demonstration of Chronicle Lite or Pro then please feel free to contact us.